This post is brought to you by: lots of experimenting, lots of recipes tried, lots of dishes, lots of mistakes and about 3 years of procrastination. 🙂 Yes, I started my research 3 years ago, took the pictures 2 years ago and experimented more last fall, and recently! 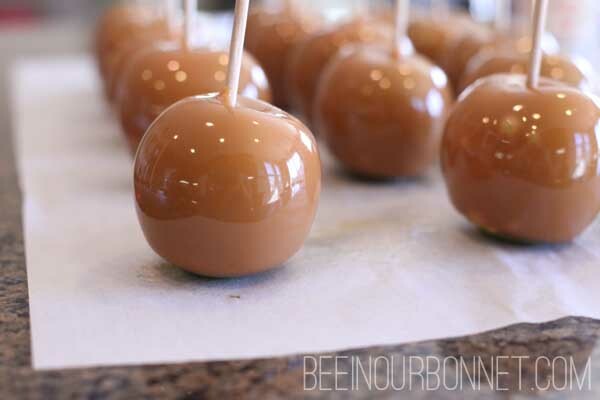 I’ve used any excuse to “need to make” caramel apples and try another recipe. I’ve made them for big and small events, but always trying to pay attention and take notes. It really isn’t that complicated, it’s just that when I try one recipe, I have to write things down, or I will be starting from scratch next time. So this post is the cumulation of all of those experiments. 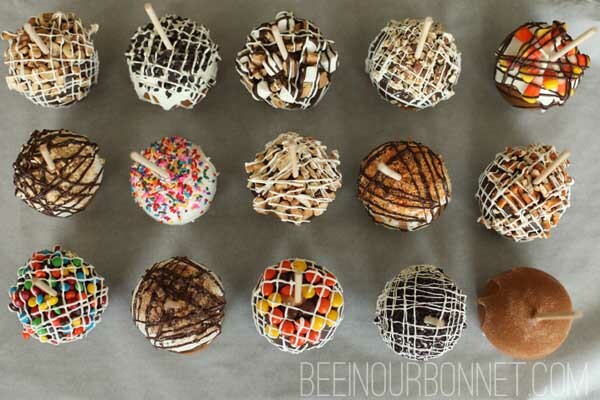 The most I ever made at once was 350 caramel apples. It was after all of those batches, that I felt like I could call it good! I also experimented with ways to put on toppings, this became my favorite “look” for may apples. The biggest thing I learned, was that GRAVITY IS MY FRIEND. I started from the top down with chocolate and toppings, letting them tumble down the sides. This was less frustrating to me than dipping part of the apple in chocolate, then having the toppings tumble down the sides. Allright, enough teasers! Let’s get down to business. I’m a fan of using granny smith apples. These are some nice round ones from Costco. You gotta wash and dry them thoroughly. 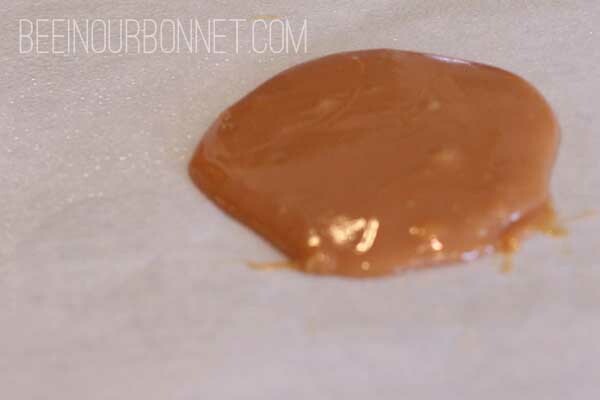 Any water puddles will mess up the caramel. TIP: Use room temperature granny smith apples that are washed and WELL dried. For the stick’s you can use what you want, I used dowels in this example. If you live near a Smart and Final, they have a great box of “caramel apple sticks” there that are pointed on the end, which makes it easier to insert. I just got dowel from the craft store, cut them, then put the cut end in the apple so it wouldn’t show. TIP: set the apple on a table, then try to put the stick in perpendicular to the apple. The apple is often crooked so if you hold the apple and put it straight though the core, it will be really crooked when you set it down. Also, it’s easier to push it in, beside, not through the core. TIP: After you put the sticks in, you will see a pool of apple juice at the top. Dab a paper towel and dry that up. 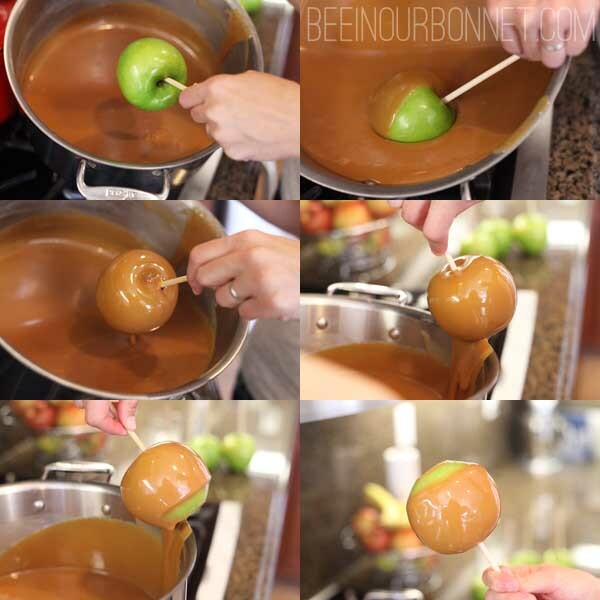 If you dip it in caramel with that puddle, it will dilute the caramel and leave a bubbly, wet hole on top later. You can’t tell once it’s decorated, that the stick isn’t in straight, or that it’s not right through the center, so don’t freak out at this point. First, melt the butter in a large stock pot over medium heat. Add the corn syrup, sugar, salt and sweet and condensed milk. 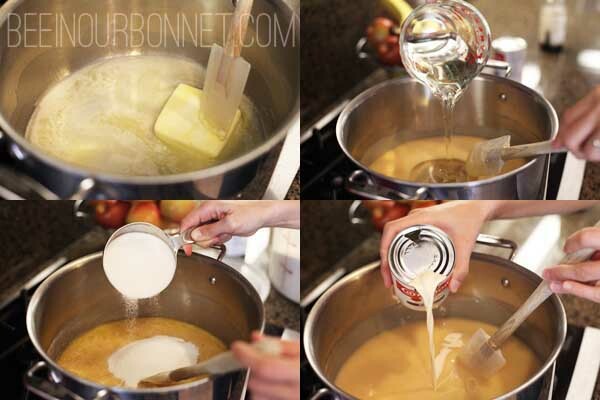 Stir on medium heat until it comes to a simmer, then add the evaporated milk. Then you need to stir, and stir and be patient. 🙂 Be sure to stir over ever inch of the bottom and side of the pan. If you don’t, you’ll end up with little burned chunks, which don’t taste horrible, but look kind of bad. When the color starts to change from ivory to light brown, it’s time to put the thermometer in. 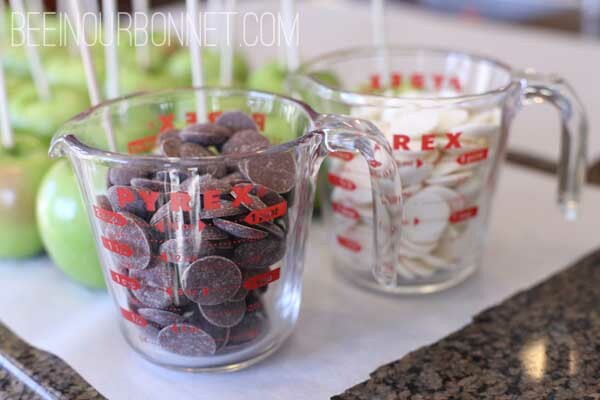 TIP: Keep stirring, going behind where the candy thermometer is clipped. You don’t want a bunch of burned caramel behind it when you take it out. Your goal temperature is around 240 degrees (between soft ball and firm ball). However, I rely on on the thermometer AND the ice water test. I’ve had two candy thermometers on the same pot that read slightly different the whole time. Because I never know if my thermometer may be off, I do the other test too. It is important to know that it doesn’t change temperature at a steady rate. It might stay the same for a while, then go up faster. Just be diligent in paying attention. TIP: Have someone else help stir while you test it out. You can stir with one hand and test with the other, but it’s trickily. Okay, the caramel is at the right temp, now take it off the heat, stir gently for another minute, then add the vanilla. Then let this sit for about 5 minutes to cool a bit. Now it’s dipping time. I tilt my pan with one hand and “dip and turn” with with the other. Then you want to shake off all the excess you can by making quick small circles in the pan. 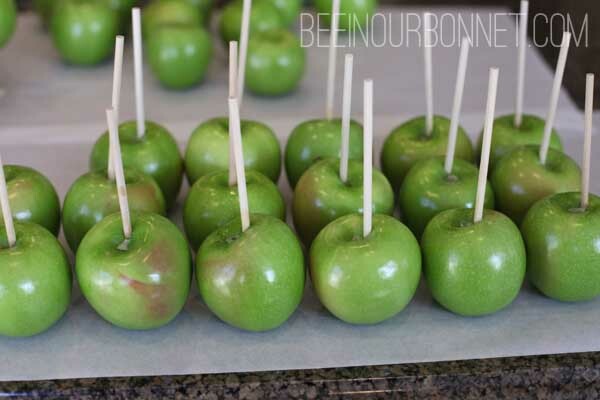 Don’t wait forever or you won’t get all your apples dipped before it cools, but quickly try to get off the excess. TIP: To avoid the caramel pool at the bottom of the apple, I scrape the bottom of the apple off on the side of the pan. Then I scrape the bottom 1/2 inch or so off at an angle. This will be covered as gravity interferes while cooling. 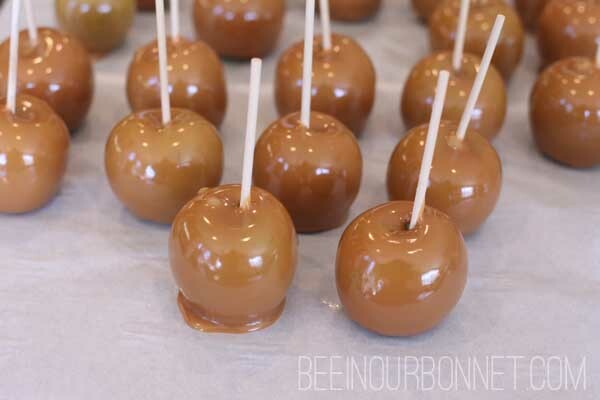 TIP: Please know in advance: with each apple you dip, the caramel is cooling. Therefore, the caramel will sag a little less with each apple. In other words, I scrape more off the bottom with the early apples, then the last few, I only scrape off the very bottom of the apple. This is a picture of one that was scraped at an angle, and is making it’s way down to cover the apple as it cools. 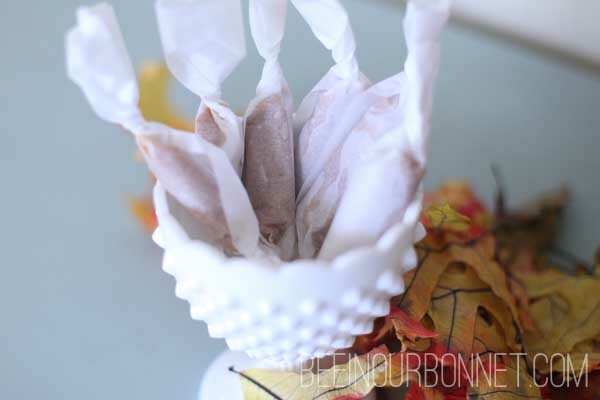 TIP: Set them down on parchment that has been sprayed with cooking spray. They will lift off easily and not get messy when you move them. 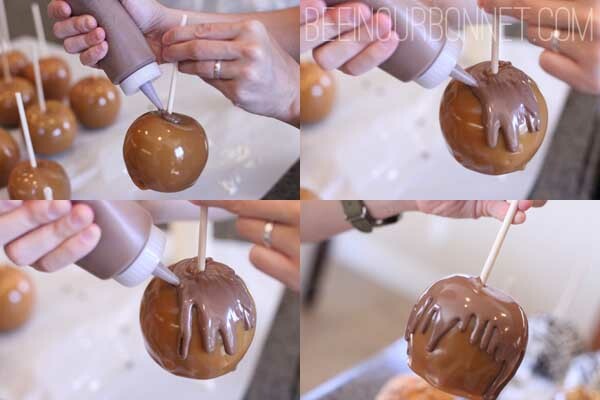 If you do this, they won’t all be completely perfect, but they won’t have huge pools of caramel at the bottom either. Now lets do a little trouble shooting. 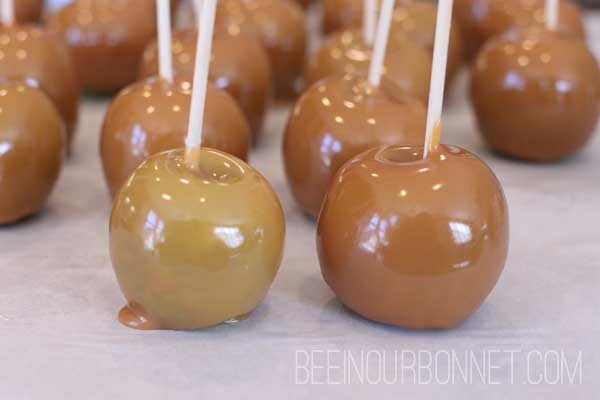 TROUBLESHOOTING: If your apple looks like the one on the left, your caramel didn’t reach the correct temp. It is too thin and doesn’t get that nice, thick caramel layer. Even the small amount on it is “pooling” a little. Another reason for pooling could be not letting it cool for 5 or so minutes after you take it off the heat. It is really thin when it’s hot. TROUBLESHOOTING: This apple is not pooling because it’s undercooked (see how it went on nice and thick) It is pooling because there wasn’t enough scraped off the bottom. TROUBLESHOOTING: Do you see the bubbles on the one on the left. The only explanation I could give to the times I got a lot of bubbles was, either stirring the caramel too vigorously while it was cooling, or not cooling it after you add the vanilla. 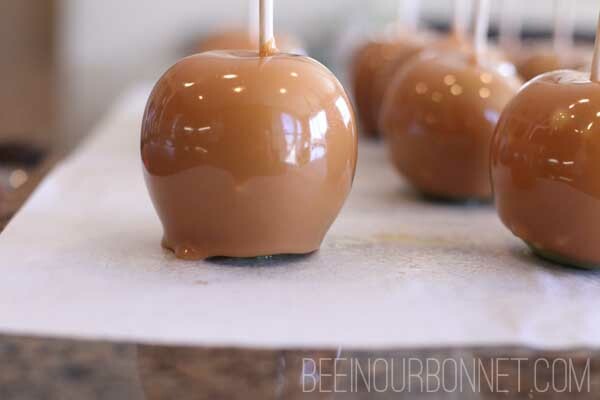 TIP: Once you’ve dipped all the apples you can, and there isn’t a big enough puddle of caramel in the pan, there will still be SOME, and we don’t want to waste it! So I pour it, scraping the sides of the pan and dump it onto a greased piece of parchment. After it cools, you can cut it with a pizza cutter and wrap it in parchment squares. These make a great gift, or something for your treat stash! Okay, are you with me still? This is TMI, I know! For the chocolate… Oh, chocolate is a whole conversation in and of itself, but I’ll just tell you how I like to do it. First, I usually use the flat melties you can buy at the grocery or craft stores. If I’m trying to impress someone, I melt down some fancier chocolate. But this stuff works great, so lets go with it. I melt it in a 2 cup measuring cup, in the microwave for 30 seconds. Then about 20 more seconds and stir. It will be lumpy, but just gently stir it until it all melts in. When it’s almost smooth, drop about 1/4 c more. This cools the chocolate a little to prevent blooming. Stir that gently till its all melted down. 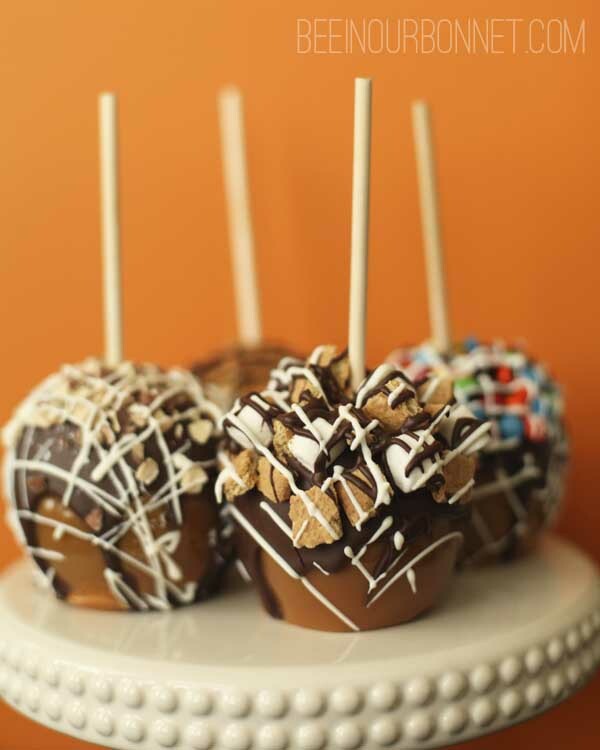 TIP: Make sure your caramel apples are at room temp when you put the chocolate on. If they are refrigerated or cool, the chocolate will harden too fast, before it can smooth out and look nice. TIP: When it’s smooth and melted, I put it in a squeeze bottle. My love for this must not be underestimated. That’s another story, but really they work great! I find it harder it easier to work WITH GRAVITY and let the chocolate melt from the top down. If you dip, you end up with lots of pooling at the bottom and sometimes the toppings don’t want to stick and just end up in that pool on the bottom. We are going with the rustic, random, drippy looking chocolate! Start by pooling around the stick, then zig zag some drips. Twist the apple till you’ve gone all around. 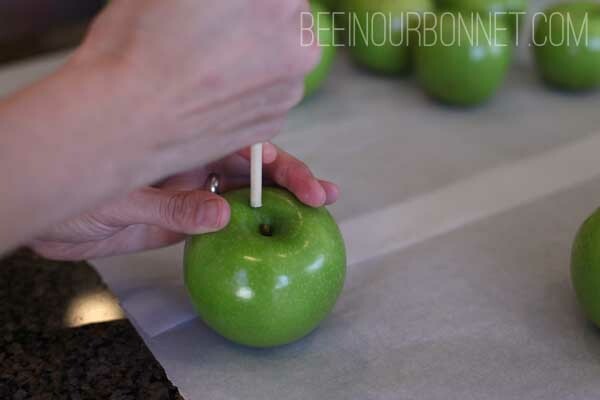 It won’t look smooth at first, so you are going to shake your apple (vertically) until the drips, drip down and smooth out. 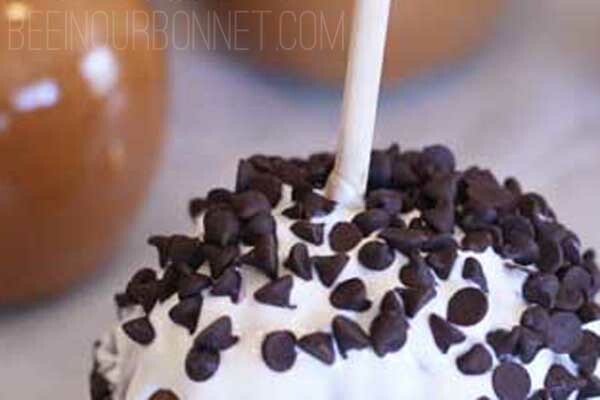 TIP: You can also get more chocolate coverage by putting it on heaver, letting it drip all the way down, covering the whole apple like in this post. 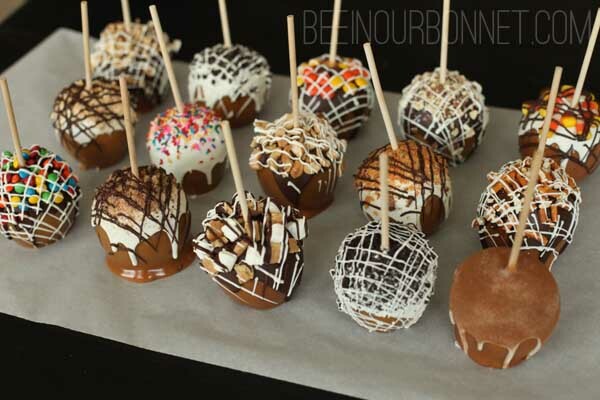 I find that I waste a lot of chocolate that way, and I usually prefer the drippy look, but it’s an option. Then you are going to add your toppings. 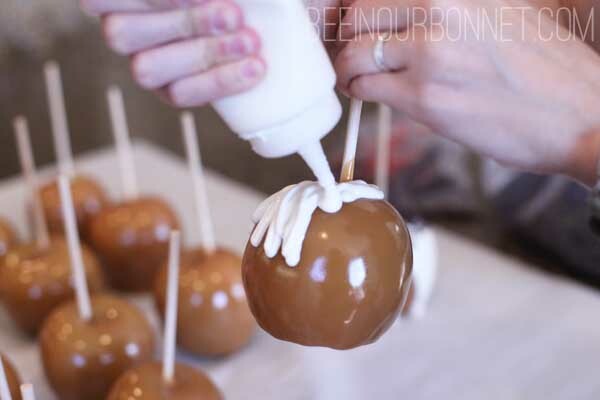 It’s okay if they tumble down the apple onto the drips a little. We are going for that look! Now that alone is enough. But I can’t help but wanting to make it fancier with a chocolate drizzle. TIP: Wait until the first chocolate and topping are dry, then drizzle another color chocolate on top. Hold at an angle, draw stripes (holding it over parchment to catch your mess), then rotate apple 1/3 way around and drizzle again. Repeat till it looks great! To package these, I bought some food safe cellophane bags. 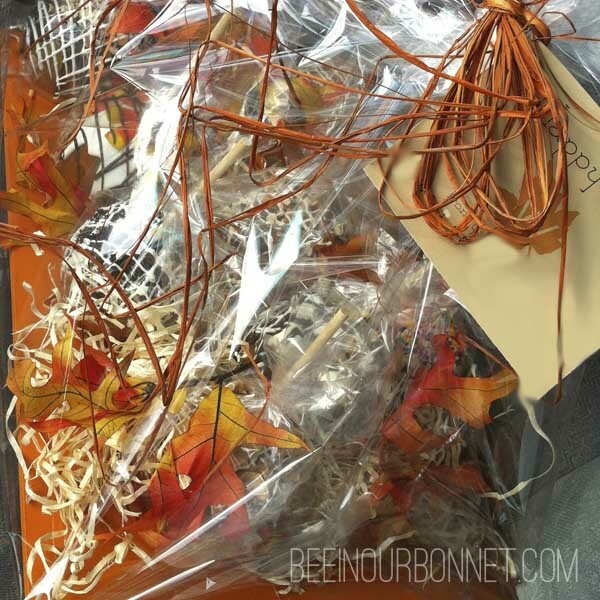 Because you set them on cooking spray, they have that protective layer and won’t stick to the bottom of the bag. I tied the bag up for freshness. TIP: These can be made a couple days in advance. If you aren’t eating them within the day, I’d put them in the fridge. I think they are good for 4-5 days in the fridge. 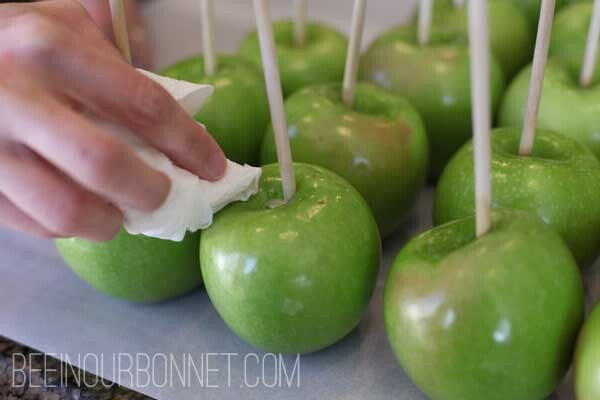 TIP: A fun way to package these, is to use a flat board or cardboard at the bottom, throw some natural filler and fall leaves on there and place your individually wrapped apples on them. Then tie up that board with cellophane. It makes a pretty gift! If you have survived this post, congratulations! 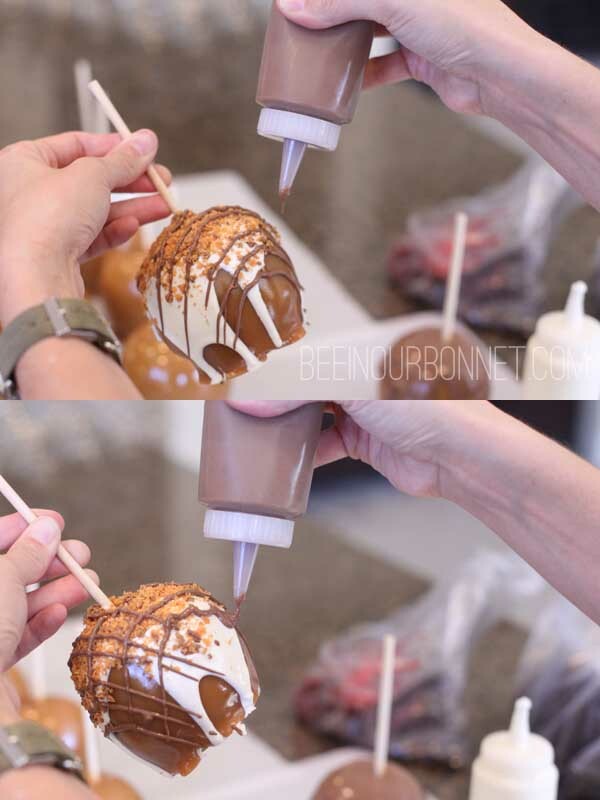 You are now too tired to go make caramel apples! Just kidding, hope it helps! I'm so excited about this information and recipe. THANK YOU. What size of evaporated milk do you use? 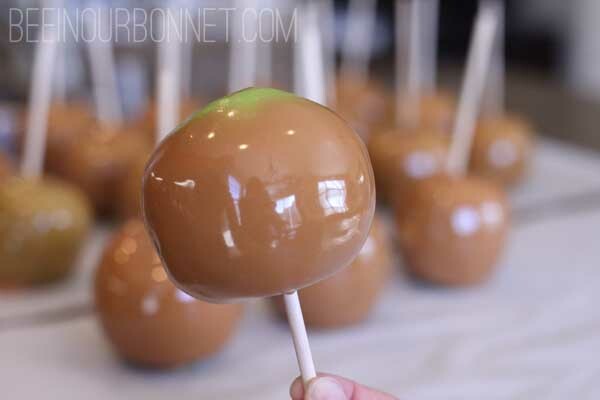 Wow, you have done your caramel apple homework! Thanks! Can't wait to try out your recipe and techniques! 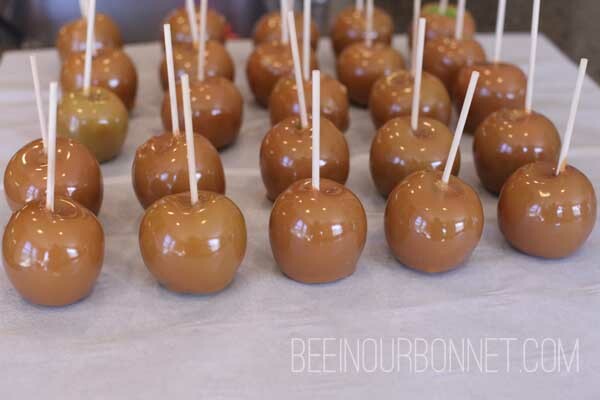 I was thinking of making some carmel apples and thought "hmmmm, I wonder if Ashleigh has posted how she makes HER apples?!" Of course you did!! Thank you for your lessons and expert advice! And for taking time to work out the kinks for one who has no patience for this!! I’m glad you found it useful! I hope it went well! 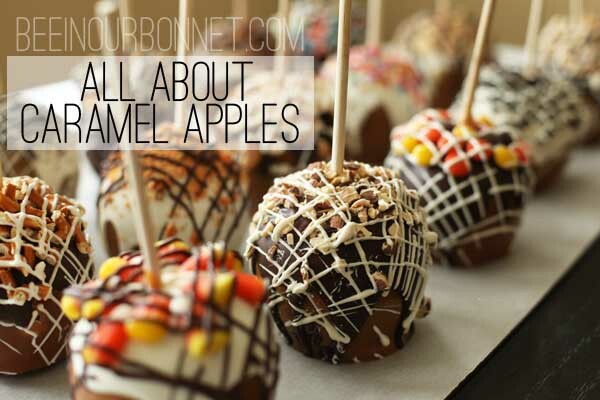 Wow, you have done your caramel apple homework! Thanks! Can’t wait to try out your recipe and techniques!